After eight years of waiting, and some 3,710 minor league at-bats, Rich Thompson made his way back to the majors. What a long, strange trip it’s been. McGILLIGAN: Baseball is a game of numbers. Often times it’s the numbers we look to for an explanation as to why a play happened or who is best suited to pitch or hit in a given scenario. We use numbers to determine greatness, justify rooting for one player over another or as a way to delve even deeper into a game we love and will never stop calculating. Sometimes the numbers reveal something you never thought they could. Take for instance 2,944 and 3,710. Heading into play on Wednesday night, those numbers were a representation of the perseverance and dedication it took Rich Thompson of the Tampa Bay Rays to get back to the major leagues after his first and only plate appearance on April 20, 2004 with the Kansas City Royals. 2,944 was the numbers days between his major league appearances which officially ended when Thompson pinch ran for Luke Scott in the Rays 2-1 win against the Boston Red Sox. 3,710 was the number of minor league at-bats he took before returning to MLB. A great story to be sure, but one that got even better Thursday with two smaller numbers – 1 and 2. 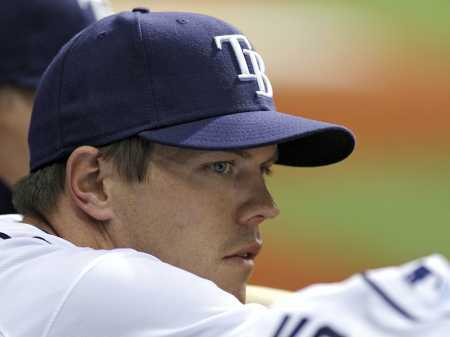 In Thursday’s 5-3 loss to the Red Sox, Thompson was in the starting lineup and hit ninth for the Rays. In his second plate appearance in the fourth inning, Thompson singled for his first major league hit and RBI as Sean Rodriguez scored on the play. But Thompson wasn’t done, he made the most of his time on the base paths by stealing both second and third base in the inning. Of all the numbers used in baseball, it’s hard to imagine any combination could have summed up Thompson’s effort on Thursday. Now he’s got a new number to worry about, extending his major league hitting streak to two games.